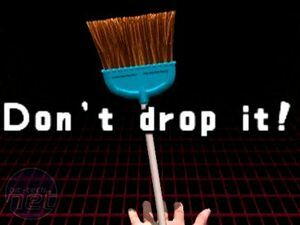 Below you will find our thoughts after getting hands-on with some of the upcoming Wii titles. 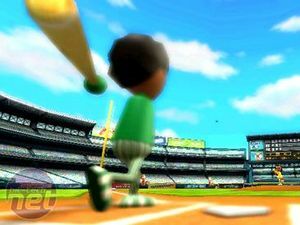 Impressions: Wii sports is a vitally important game for Nintendo. It comes as part of the Wii package so will be sitting there when you first unpack your Wii. It consists of a few simple sports game such as bowling, tennis, golf and baseball. Controls are very limited and generally involve you moving as you would in real life to create movement on the screen. The problem Wii sports could have is that without the multiplayer element this game is fairly shallow. Its great fun when playing with a friend though, both of you dancing around the screen as if on drugs, laughing and giggling like children. The game provides a huge incentive for new Wii owners to rush straight back to the shop and buy another controller, which I will come back to in my conclusion. Impressions: Excite Truck was brilliant fun even though I was absolutely awful at it. The idea is simple, hold the Wii remote as if it was a steering wheel, use one button to accelerate, one button to brake and tilt the control to steer. It sounds easy but is actually pretty tricky to get the hang of at first. 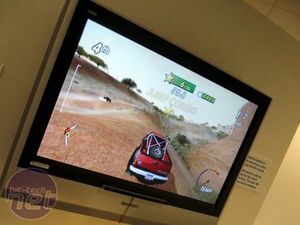 Of all the games I saw this was definitely the most next-gen like, fast paced racing round dirt tracks, smashing into trees and making huge jumps over chasms all going on at once. It was also the most pleasing on the eye – certainly not comparable to a 360 or PS3 title but still pretty nice. Certainly one to watch for all you racing fans out there. Impressions: We got our hands on one of Nintendo's biggest hitting franchises, Zelda, which is due to be released for both Gamecube and the Wii in the next couple of months. I have to say my first impressions weren't great; the game looked pretty dire when compared to other next-gen titles, suffering badly from a lack of anti-aliasing. Despite voicing my concerns to the Nintendo-rep he replied by telling me Nintendo "weren't worried about the graphics – it's all about the gameplay". Soldiering on I played through a few levels, and found myself enjoying what was essentially Zelda Windwaker with a less cartoony and more serious graphical appearance. All Link's old tools were present: the sword, the shield, the grappling hook, and of course the ability to use the Wii remote. The implementation of this is fairly simple, press a button when the arrow is drawn and you'll receive an aiming reticule you can control using the remote. The sword is also easily controlled, through slashing and jabbing motions which can be strung into combos. 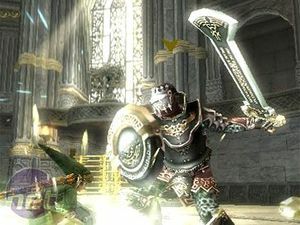 I think Twilight Princess will be the must-buy title for Wii gamers this coming Christmas. Despite the dodgy graphics, the strong following the Zelda franchise already has, plus the fact that legendary game designer Shigeru Miyamoto is still at the helm will provide a big incentive for people to buy this game. Zelda: The Twilight Princess is definitely one to look out for. Impressions: Elebits is a bit of a mental game. Essentially it is a light gun/first person shooter in which you're tasked with shooting electricity at little fluffy creatures called Elebits. These little monsters are hiding in a house (in the level we played they were hiding in a kitchen) and you have to walk around zapping objects like a frying pan or cupboard drawer to uncover them. By shooting them you receive electrical power which you can then use to turn different utensils in the room on such as the fridge or oven. This generally gave access to more Elebits and the whole random, bizarre, electrifying-small-balls-of-fur-to-get-more-electricity process continued. I feel Elebits sums up Nintendo's general strategy, a game that will serve as idle amusement, which can be picked up and played by anybody. How the gaming public will react to that remains to be seen. Impressions: Trauma Centre is a doctor sim that's great fun. Based on a DS Lite game, the idea behind it is simple: you're a doctor who is tasked with saving lives. 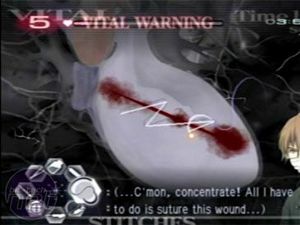 By using the Wii remote you perform surgical operations; such as stitching people up, applying ointment and removing foreign objects such as glass. Between saving peoples lives you'll encounter a story worthy of Casualty, involving love triangles between doctors and nurses presented to you in a typically Japanese anime style. As of yet no word on whether there will be a gynaecology expansion. Impressions: One of the best games for the DS Lite makes an appearance on the Nintendo Wii and to be brutally frank, it's more of the brilliant same. A series of mini-games that will be ideal for children and definitely have some appeal to adults too. There is very little I can say about this game, you are tasked with doing things like blowing up balloons or high-fiving your pet dog and all this is done through the Wii remote. Addictive and fun, it's a game I'm looking forward to playing come Christmas. Don't get me wrong, this preview wasn't intended to slate the Wii and everything it stands for. The Wii is fun to play and has some interesting titles lined up for release. What I do want to do is provide a little realism. Too many journalists are giving out the impression that the Wii will provide an unbelievable, unique experience unlike anything you will have ever played before. That the Wii remote allows for completely dynamic gameplay that will revolutionise the gaming world. These facts are half-truths, based most probably on people spending a small amount of time with the console at a booth at one of the big conventions. When you get down to the nitty gritty of the Wii you find something a bit different from the 360 and PS3, but not drastically as you may have thought/hoped. We will soon see whether my rather less positive preview of the Nintendo Wii is correct. The console is due for release on November 19th in the US and will land in Europe on December 8th. Currently the Wii is priced at £179.99, coming with a nunchuck, Wii Sports and the Wii remote. If, however, you're looking forward to playing some multiplayer Wii Sports then get ready to shell out around £210, as you'll need to buy an extra remote which will cost you £30. 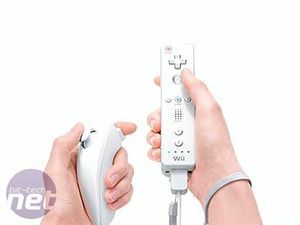 The fact that this second remote is essential for the Wii experience raises an interesting question. 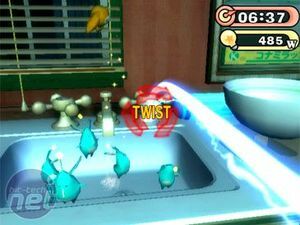 Peter Moore claimed, not so many months ago, that the consumer would be able to buy the Wii and 360 for less money than a Playstation 3 – spawning the name 'Wii60'. In actuality the PS3 will cost around £430 but the combination of a 360 premium and a Wii with two remotes will actually be close to the £530 mark. Remember, that's without a HD DVD drive and with only a 20GB hard drive instead of the 60 GB one found in the PS3. It leads us to one final question (and our only 'wii' gag – aren't we mature?) 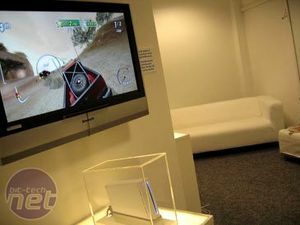 about Nintendo's upcoming gaming console: Are Nintendo and Microsoft wiieally going to Wii all over Sony? The answer, surprisingly, is maybe not.